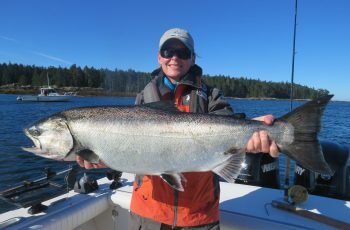 Weather and fishing continues to cooperate for us here fishing Langara Island. Our third trip has just finished off and everyone seems pleased with the experience here at the Clubhouse. 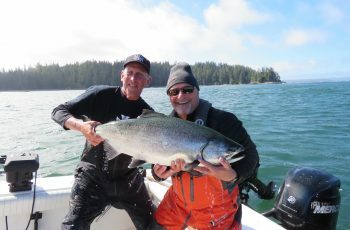 I had a long-time patron Tim Sorensen out yesterday and we teamed up for a great fish on the west side. 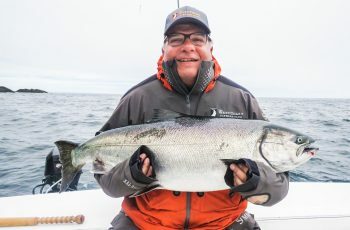 Tim has fishing here a number of years but never had the luck to personally reel in a tyee, so this was his day finally, Winning! Tim has the casual approach, head out at the crack of 8:30 am, come in for a nice lunch and head out at 2pm. we set up at 2:30, lines in, not much happening. Back and fourth, soon the music was on and a cool beverage was in order. Next was story time, and right in the middle of telling a classic screamer story, Tim’s mooching rod off the stern thumped and buckled, a heavy fish of some sort. Acting strange, not sure if this is a shark or a lion. The fish moved right into the island before heading straight to the bottom, then slowly swimming out. Good news, not surfacing for air so not a mammal. Soon we had a glance, not bad, rolling and twisting a few feet under the surface. Tim was on this fish for a half hour, slightly lost interest and began telling his own classic stories. I was a tad nervous, but hey, Tim can fish so relax a bit Screamer. Finally a weight shows and hmm, that looks like a good one. 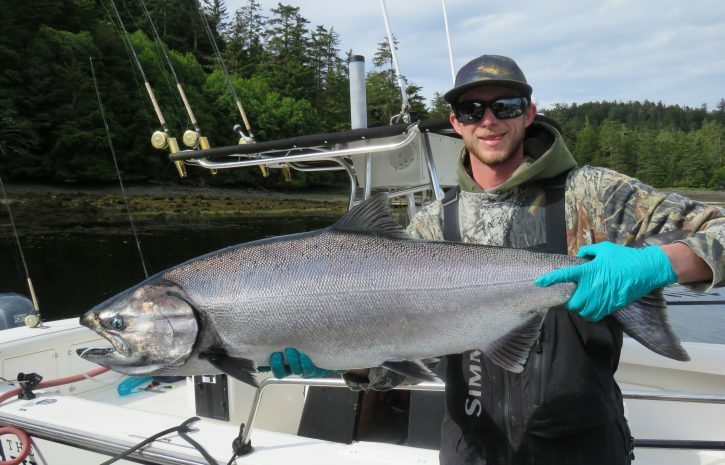 First pass by the net a 41 lber, nice first tyee. We gently placed her in a release tote filled with water and worked her back into good health. She was tired but swam off happily towards deep water, what a sight, way to go Tim! 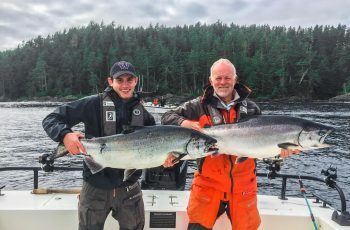 Although slow, we soon had a 29 to the boat for Tim’s partner, a fish that wiped out George Gaffne’s lines fishing in a Langara boat…what a mess but thanks to them cutting lines we had the fish, not a huge fight as three weights were tangled on the fish. 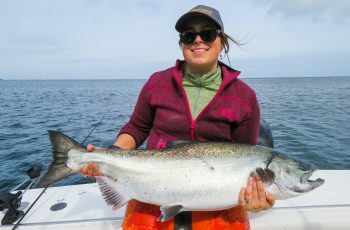 We soon grabbed a trolled up halibut of 45 lbs, so a fun afternoon for sure. The boys on the grounds, all had nice hali, Bud released a 200 plus after photos, and lived to tell about it. Leave the hook in Bud, we need you to guide tomorrow. Tough trying to save your hook worth a buck when it is in the lip of a monster. We have some drizzle this pm but the seas are calm. Looks like a great trip coming up. Chinook have slowed a bit but with the size we are all anticipating a great afternoon. Look out for the next report, hope to have a story about another great release. Great story about the 41# fish. It could have been mine or Heine’s! Really bummed we could not make this year!